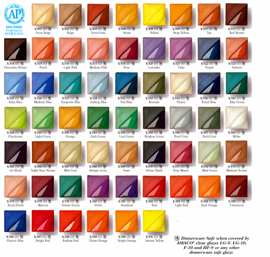 All colors in the Velvet Series are AP NON-TOXIC. AMACO Velvets semi-translucent underglazes offer two finish possibilities. When left unglazed they have the appearance of velour or velvet. They will intensify in color when covered with a Clear Transparent Gloss glaze. Velvets 380-384 have a unique formula that makes them very versatile. They can be used in detailed design work as a Cone 05/06 underglaze or they can be fired up to Cone 6 and maintain their intensity and brightness. All the Velvets are very rich colors and can be used for an all over coverage similar to an opaque underglaze. They fire true to color as applied from the jar and may be intermixed to create a palette of hundreds of colors. The colors may be brushed (1) on greenware which is to be bisque fired before applying a covering glaze or (2) on a mature Cone 04 (1971 F, 1077 C) bisque, then a covering glaze applied. For opaque coverage by brushing, the consistency of the color in the jar is correct. Velvets tolerate a wide firing range with recommended firing temperature being that of the clay used. NOTE: V-317 Medium Pink will change color and blister at Cone 5. V-303 Terra Cotta will fade away when glazed over. If you need to use this color and glaze it, then substitute with V-366 Teddy Bear Brown. Velvets were developed to be used without a glaze cover. V-327 will appear Green Turquoise under LG-9 and Blue Turquoise under LG-10. AMACO Velvet Underglazes have only been tested and approved as dinnerware safe when applied and fired under LG-10 Clear Glaze. They should not be used on surfaces which come in contact with food or drink. If left unglazed, AMACO clear glazes LG-9, LG-10, F-10 and HF-9 or any other dinnerware safe glaze are recommended to be used over AMACO Velvets to make them dinnerware safe. For best results with V-317, 318, 321, 322, 325, 326, 371, and 375 apply only two coats of LG-10 Clear Glaze. Tableware producers must have all finished ware tested and approved as safe for dinnerware through a certified laboratory due to possible variations in firing temperature and possible contamination. Velvet Underglazes are also available in Pint Class Packs and 2 oz. sets. These Amaco Underglazes are all AP Non-Toxic. 20% Off 12 or more. 10% Off 6 or more. Full Page Color Reference pdf.